Kathleen Hanagan today announces the first printing of her book, “Loveseed: The Template For Birthing A New World,” (Library of Congress Control Number: 2018959127, ISBN: 978-1-945586-14-9) by Thomas Noble Books, Wilmington, Del. 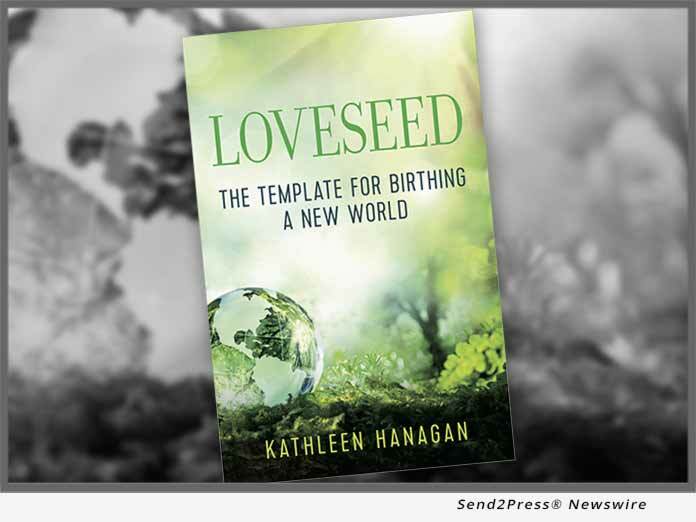 (ALEXANDRIA, Va.) — NEWS: Kathleen Hanagan today announces the first printing of her book, “Loveseed: The Template For Birthing A New World,” (Library of Congress Control Number: 2018959127, ISBN: 978-1-945586-14-9) by Thomas Noble Books, Wilmington, Del. “Loveseed: The Template For Birthing A New World” comprises a guidebook through an inner journey to higher consciousness in which the author-a psychotherapist-is both companion and guide. The book was edited by Charlon Bobo, with internal design by Balaji Selvadurai. “Loveseed: The Template for Birthing A New World” may be purchased in print or electronic formats on Amazon, https://www.amazon.com/dp/1945586141. The announcement coincides with the launch of Hanagan’s much-anticipated, free master class series, “Conversations with Co-Creators of the New World,” runs today through Nov. 30. Individuals may sign up to receive the free video master class series by email at https://www.kathleenhanagan.com/newworldpr. The series extends the themes found within Hanagan’s book. Her writings recount dramatic real life experiences, combined with compelling mythic tales. The result is a profound exploration of humanity’s need for greater depth and the individual’s multidimensional nature. The text is recommended reading for parents and teachers, counselors, healers, and mentors who want to encourage and support those they serve. “The task of personal transformation can be an inspiring way to contribute to the greater good,” says Hanagan. Storytelling, science, psychology, shamanism, spirituality, and cases from Hanagan’s 30 years as a psychotherapist, combine to weave the threads of ancient wisdom with the emergent intelligence of our times. This synthesis helps readers integrate and expand their awareness beyond the subconscious limitations of a culture that has lost its Soul. * To move out of the “trance” where one is identified with one’s pain. * To clear away the deadwood of old habits and reactions that no longer serve, and create healthy and energizing practices that allow an inner light to shine. * To connect with and embody a compassionate loving nature. * To remind each person of the vastness of his or her mission. “Engaging with this book will allow readers to receive the inspiration to take the necessary risks they have been avoiding. They can now rediscover the Loveseed template for their soul’s purpose,” says Hanagan. The author additionally marks the publication with a book launch celebration hosted by Sara Vandergroot. The event is at Mind the Mat Pilates and Yoga, at 2214 Mount Vernon Ave., on Nov. 17, 4-7 p.m. Advance copies may be reserved at https://www.kathleenhanagan.com/loveseed-a-new-world/. Hanagan’s reading of excerpts from the work will be accompanied by Ahmad Nadimi, creator of the compact disc “Suite for Peace.” Nancy Belmont, www.vessence.com, will facilitate interactions designed to engage attendees and activate their Loveseed templates. Kathleen Hanagan, https://www.kathleenhanagan.com, is an author, spiritual teacher, modern mystic, and psychotherapist whose work integrates the essential wisdom of the great spiritual traditions with scientific knowledge, more than three decades of professional experience, and her own quest for liberation. Her first book, “Loveseed: The Template for Birthing A New World” (ISBN: 978-1-945586-14-9) is available in print and electronic formats on Amazon, https://www.amazon.com/dp/1945586141.